You will earn 3,249 Reward Points. Earn 1 reward point for every 1 dollar spent. Exterior Top: Constructed of heavy duty stainless steel, with integral 2.12" (5cm) high square nosing at the front. Top is insulated with high-density insulation. Exterior back and bottom are galvanized steel. Exterior ends are finished with stainless steel. Interior base has stainless steel back and bottom. Interior ends and door frames are thermoformed ABS plastic. Base is insulated with high-density foamedin-place environmentally friendly, Kyoto Protocol Compliant, Non ODP (Ozone Depletion Potential), Non GWP (Global Warming Potential) polyurethane. Each interior door section has (1) removable epoxy-coated wire shelf. Door(s) have stainless steel exterior front, with a thermoformed ABS plastic interior liner. Black recessed handle(s) and a snap-in magnetic gasket which is readily replaceable. Base has a machine compartment, standard on right, with a condensing unit with condensate evaporator and an electrical junction box installed. 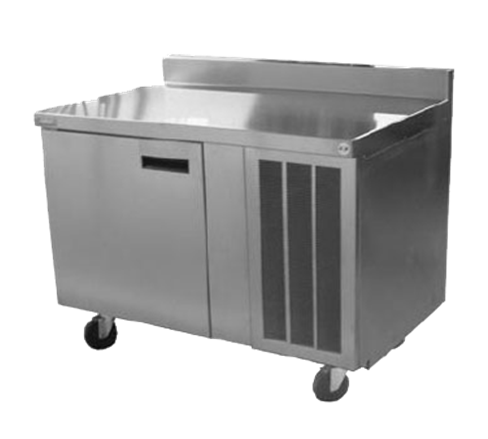 Machine compartment has a removable louver for access to condensing unit. Blower coil(s) with expansion valve are located behind the door mullions. Refrigeration System: R290 refrigerant, and maintains 36˚F (2˚C) to 40˚F (4˚C) interior cabinet temperature. Interior cabinet is cooled with mullion style blower coils (coated) with expansion valves mounted between each door/drawer section for even air and temperature control. Electronic temperature controls and pre-wired condensing unit with hot gas condensate evaporator are installed in the machine compartment. Electronic control for base reads air temperature. On/Off switches for base are located behind the louvered panel.